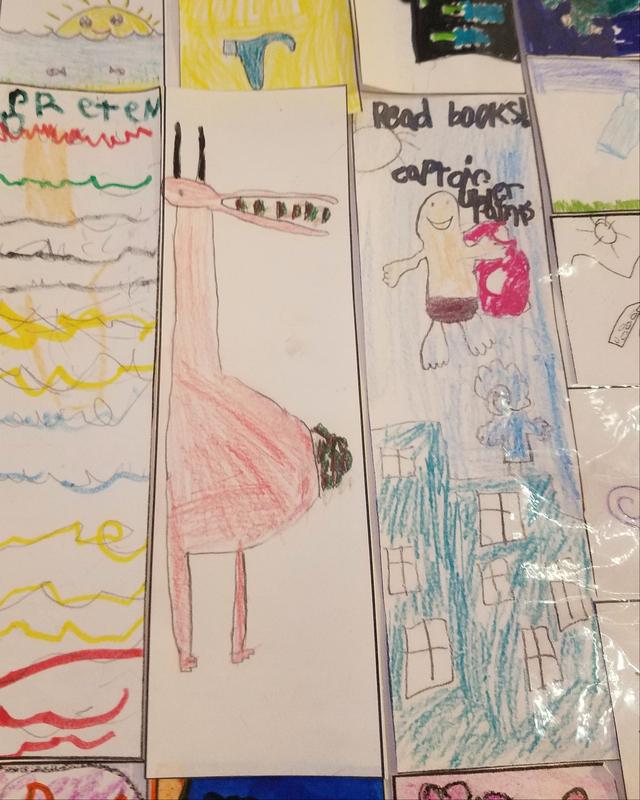 We got up our annual bookmark contest on our cafe art wall last week, which is one of my favorite times of year. 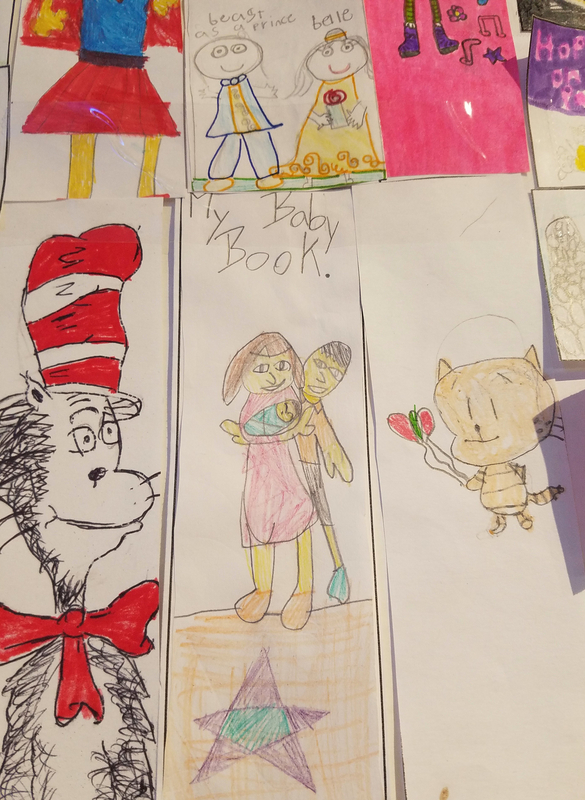 The prompt encourages kids grades K-6 to create a bookmark inspired by their favorite book. 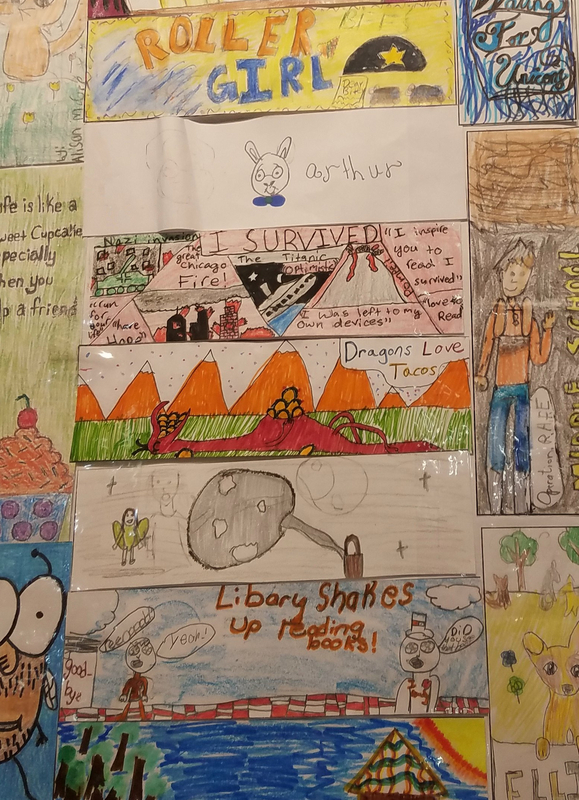 And what we get back are hundreds of colorful, hand-drawn tributes to books that when viewed together generate an entirely kid-driven buzz list. Of course you get a fair few cats in hats, boy wizards, and elephant-piggie pairs every year. It’s definitely interesting to track trends up and down, which tells us that Pokemon is on the rise and that Dog Man is catching up to Captain Underpants. Those trends are no big surprise, but it’s still fun to see what kids are buzzing about. You also get a few entries that have clearly been done by friends sitting together and collaborating on similar designs. You can see the influence of community events too. 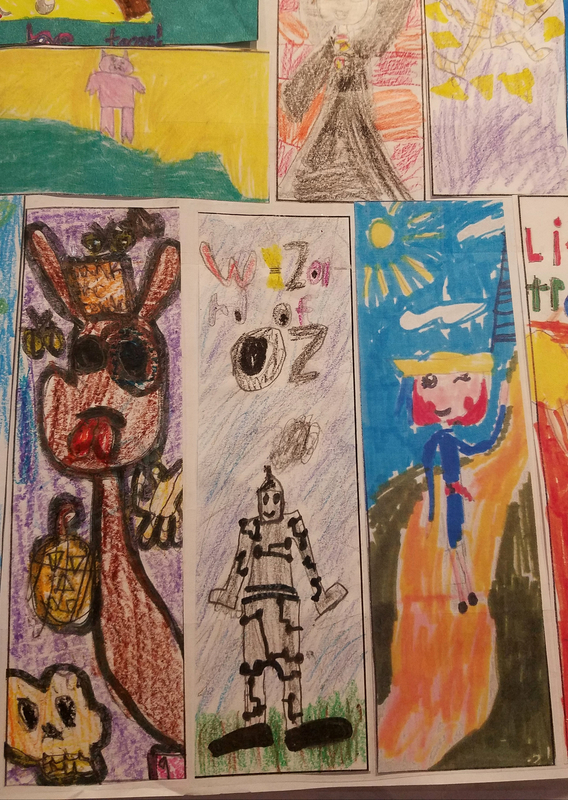 Last year’s musical in the park was devoted to The Wizard of Oz, and lots of schools around town coordinated with performances of their own, so it’s no surprise to see a surge in representation there. 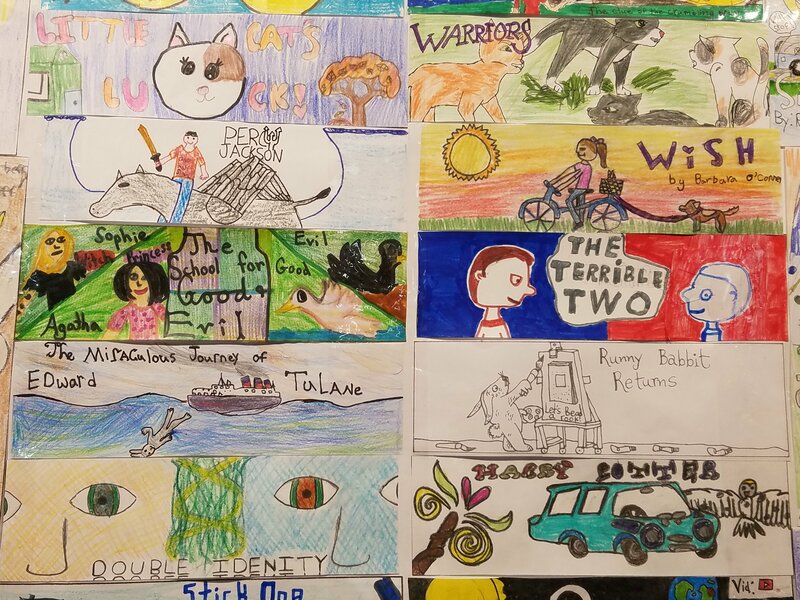 But even among odes to the trendiest of characters, some artists manage to stand out with interpretations that offer just a little something extra, whether that’s personality or humor or good old artistic talent. 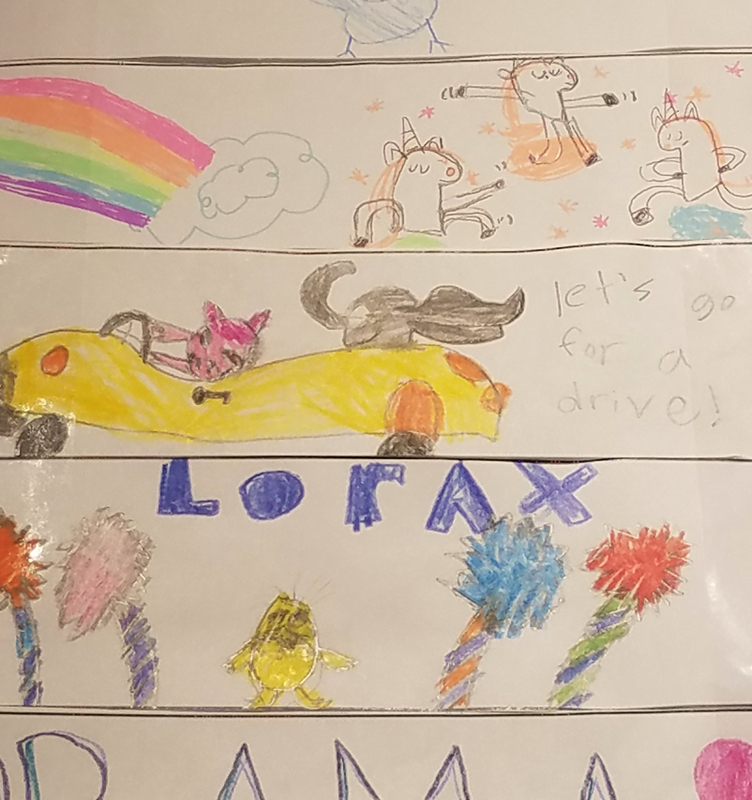 Take a look at the joyful energy in this elephant and piggie as they go for a drive, the valor of this Dog Man, the charisma of a particularly well-drawn Harry Potter, or the hopefulness of this Tin Man (dreaming of his heart perhaps?). Sometimes it’s the composition itself that catches our eye. 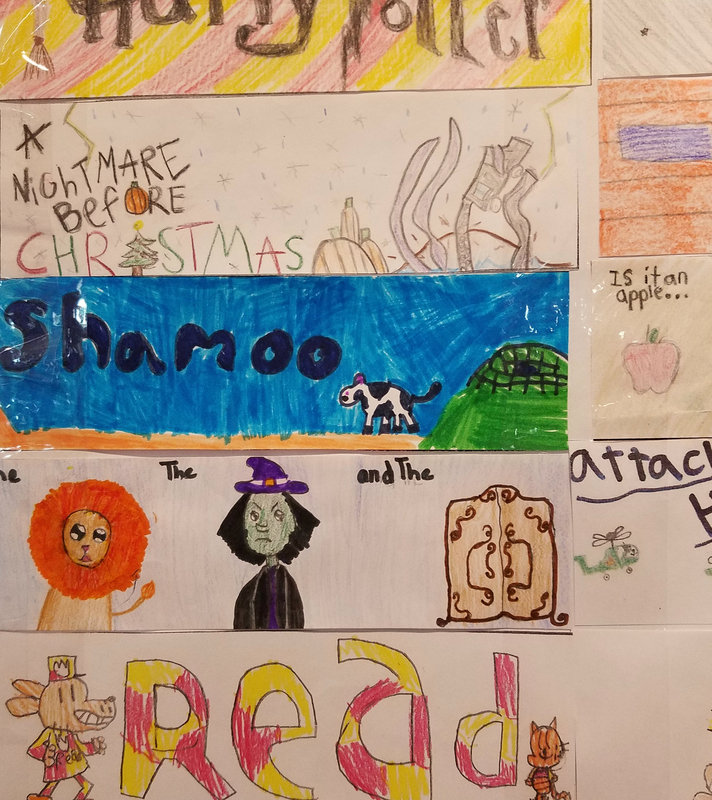 Can you feel the danger lurking along Little Red Riding Hood’s journey through the woods as she glimpses the safety of Grandmother’s house ahead? 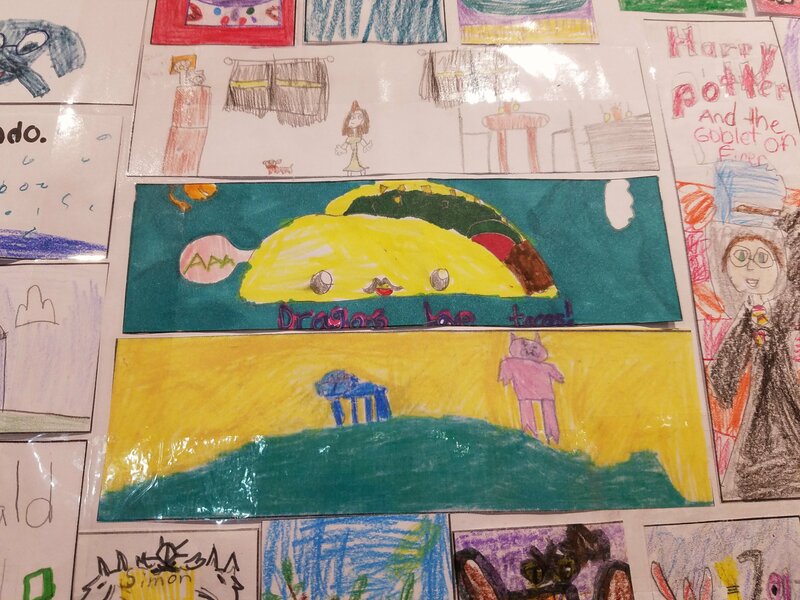 Dragons Love Tacos inspired some hilarious tributes this year that really speak to the irreverent silliness of the book’s premise (and the popularity of tacos in Austin). I particularly love the enormous taco yelling “AAH,” whether in fear of being eaten or out of some other impulse, I can’t really say. 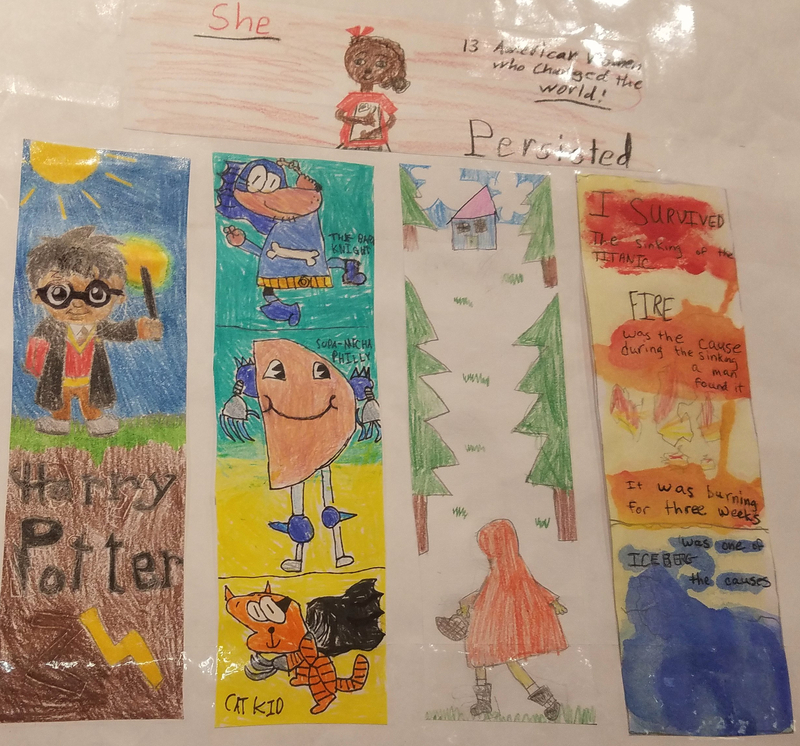 What I really love seeing in the group are the one-offs, the bookmarks that aren’t as reflective of a trend as much as one kid’s love of something special. 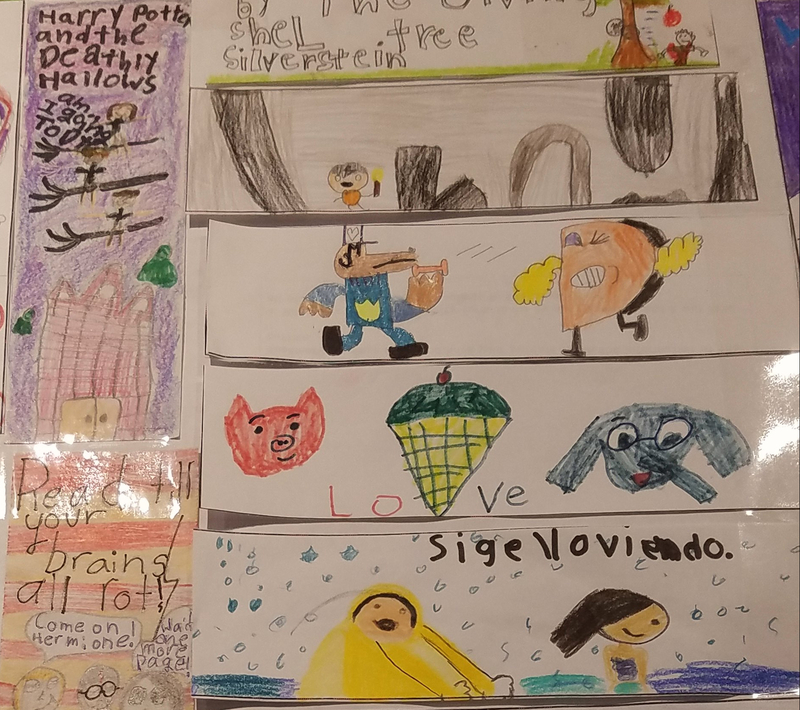 Here’s where you can appreciate a beautiful pencil sketch of Runny Babbit at his easel, a rebus of The Lion, the Witch, and the Wardrobe, or a look at Shamoo, A Whale of a Cow. 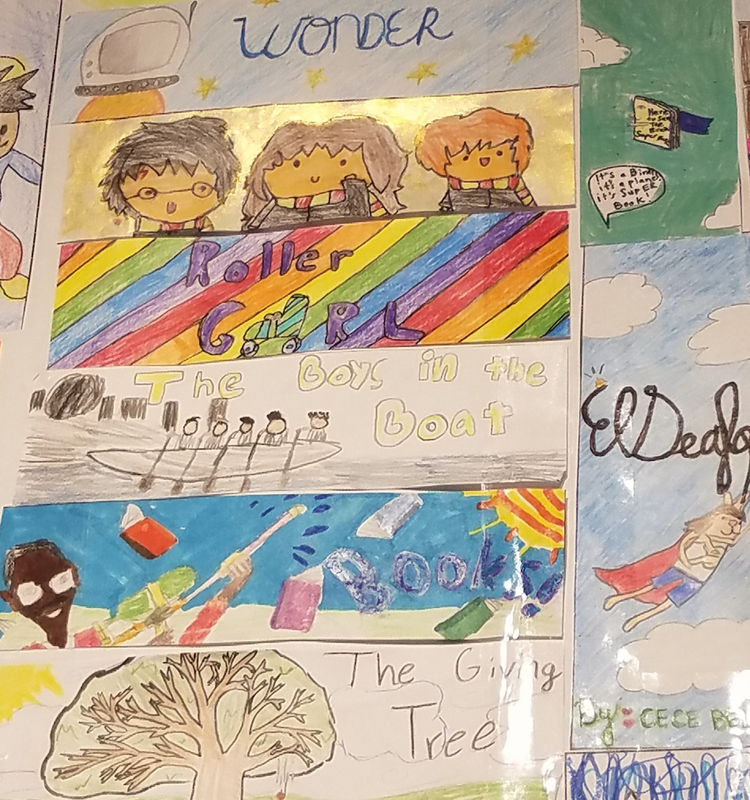 You can see which nonfiction stories stuck in kids’ minds, whether it’s a tribute to the clever inventor of the super-soaker as chronicled in Whoosh! or the perseverance of the Olympians profiled in Boys in the Boat. And you can even get little glimpses into the ways books help celebrate transformative life events, like this touching portrait of a family from My Baby Book, possibly a journal of the reader’s or their sibling’s very first year. If you’re in the area, stop by. 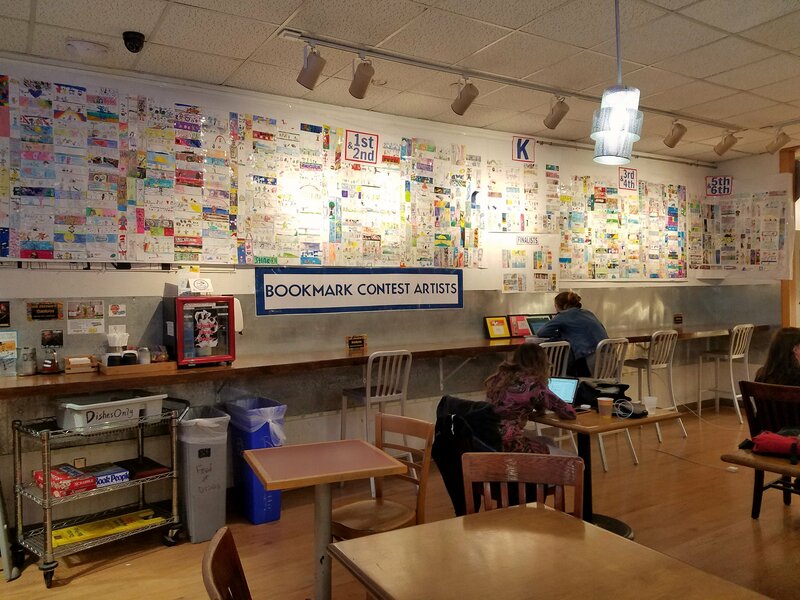 The art wall will be gone by May, but bookmarks by the winners will be available for free all year long! This entry was posted in Uncategorized on April 13, 2018 by Meghan Dietsche Goel. Meghan Dietsche Goel is the Children's Book Buyer and Programming Director for BookPeople in Austin, TX. What an incredible turnout you had!! I am a children’s librarian in Cannon Falls, MN and am thinking I would like to try this! Did you ask for particular measurements for the book mark? If so, what size did you find worked the best? Thank you for sharing! It’s amazing!